On the stove, fill up a sauce pan with the milk and cream, bring it to a boil. 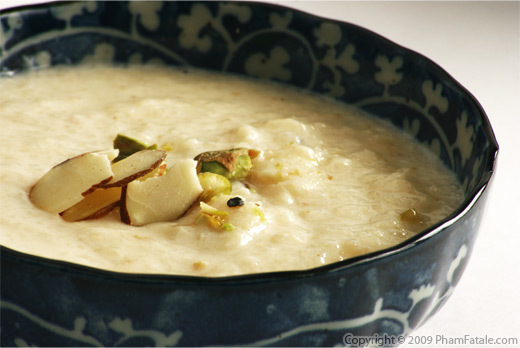 Remove from the heat right away and add the white chocolate. Keep stirring until the chocolate is melted. Separately, whisk the egg yolks with the sugar in a mixing bowl until it becomes a pale yellow. Add the vanilla extract and combine the chocolate liquid with the egg mixture by slowly adding a ladle of the milk mixture at a time to prevent the yolks from curdling. Strain through a fine mesh to make sure there are no chunks of chocolate left. Fill up 6 mini ramekins with the mixture. Place them in a warm water bath in a deep baking pan. The water should go half way up the side of the ramekins. Cover the dish with a sheet of aluminum foil and place in the oven for 35-40 minutes. 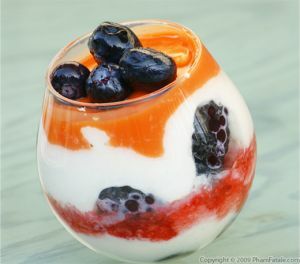 Let it cool down and plastic-wrap each individual ramekin and place in the refrigerator for at least an hour. 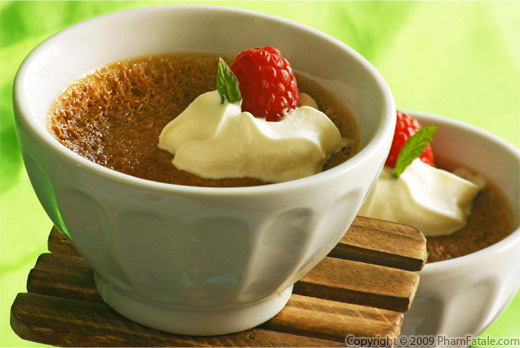 The fat from the cream may pick up some other smell from the refrigerator if the ramekin is not sealed properly. When serving, sprinkle a teaspoon of sugar in each of the ramekins, then caramelize with a blow torch. While waiting for the milk and cream to boil, you have to be very careful. Don't go anywhere else. If the phone rings or someone's at the door, let it be. You gotta focus on your milk and cream otherwise you'll be cleaning your stove and scraping the burnt milk all night long. As soon as some bubbles come up, remove from the stove and immediately add your chocolate chips. I used Guittard lemon apeels. I got them directly from my local market at the Milk Pail Market, 2585 California Street, Mountain View, CA 94040, but you can order through eBay if you can't find them. 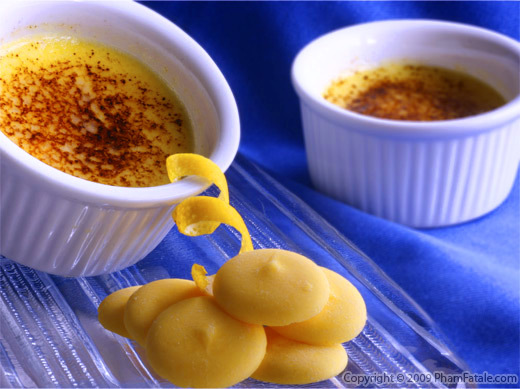 I like to serve my creme brulees in tiny size ramekins so that my guests always ask for more. I serve them in 6 mini-ramekins or you can serve them in 4 regular ramekins for very hungry (greedy) dessert eaters. If you don't own a blow torch, put the ramekins on the broiler of the oven until the sugar caramelizes. Published By: Jacqueline Pham on January 7, 2009. Hi! I love your blog and your recipes. Can I ask what is "lemon peel chocolate"? 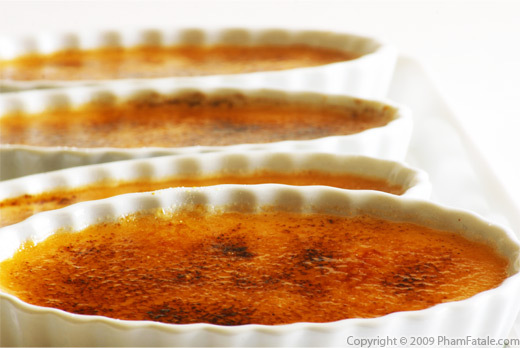 They are pictured next to the creme brulées on the photo. It's a lemon zest-flavored white chocolate chip. Guittard manufactures this product. You can find them on ebay (see tip section). Hope this helps! I tried your recipe last night. It tasted great, but it was kinda oily. Do you know what's the reason, and how I can avoid this? Thanks!